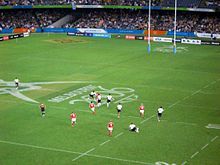 The rugby sevens at the 2006 Commonwealth Games was the third Commonwealth Games at which rugby sevens was played. It is one of the male-only sports at the Commonwealth Games, the other being boxing. The venue for the rugby competition was the Telstra Dome, on the western edge of Melbourne's Central Business District. Preliminary matches were held on 16 March, with the finals the following day. 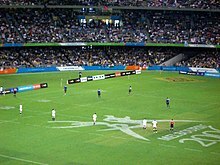 The gold medal was won by New Zealand who defeated England 29–21 in the final on 17 March 2006. Fiji won the bronze medal, defeating Australia 24–17 in the 3rd place final. The game was overshadowed by a fit suffered by Australian Scott Fava after a legitimate tackle. Fava recovered quickly and was released from hospital the following day. New Zealand continued its undefeated streak at the Commonwealth Games in 2006.